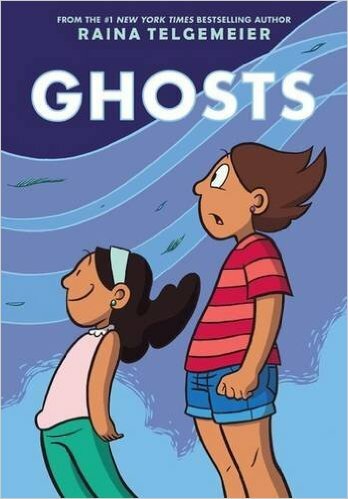 Ghosts is another wonderful all-ages graphic narrative by Raina Telgemeier, whose earlier award-winning works included the autobiographical Smile and Sisters. Ghosts is the story of a family moving to a new home in a fictional northern California town (Bahía de La Luna; Moon Bay in English) whose air is supposed to be better for the youngest daughter (Maya) who has cystic fibrosis. Cystic Fibrosis is a degenerative genetic disease that causes mucus to build up in the lungs making breathing difficult. Graphic Medicine community member (and 2016 conference organizer) Andrew Godfrey reports that current median life expectancy for CF is 41 (that is, 50% are expected to live longer than 41) in the UK and 40 in the US with people born with CF today expected to live in to their 50s (and with any luck beyond). Without providing any of these details directly, but through a slightly older sister’s eyes (Catrina), the reader gets enough information to understand how serious this disease is and its effect on the family. The book is beautifully and simply drawn with excellent coloration provided by Braden Lamb. I highly recommend this book. The story moves from the real to the magically real as we learn about the town being inhabited by ghosts who are especially active around Dia de los Muertos (Day of the Dead). We see playful & joyful Maya being treated with oxygen, a vibrating vest to loosen the mucus with which Maya adds the loud vibrating sung LA-A-A-A-A-A-A-A-A-A-A, a feeding tube for Maya to get additional nutrition, and a later hospitalization after a strenuous day exploring the outdoors on a ghost tour with Catrina and a local friend, Carlos. Catrina feels guilty about Maya’s hospitalization and also blames Carlos, which might destroy their blossoming friendship. We see Catrina being a child with relationships and frustrations and a pseudo-adult feeling she must make undesired sacrifices for her sister’s sake. We learn that their mother, Leona, feels guilty about how she didn’t learn much of her mother’s culture, especially cooking. And we learn about death and what it might mean. The magical realism allows death to not be the end, at least while others are alive who remember the life of those who died. What might death mean to a child who understands their disease will shorten their life? When I read this book, I put pieces of paper in my copy to mark pages that I thought might be worth quoting from but I decided that providing those quotes would be insufficient. Each passage builds on something that was shown or said at an earlier point, so I have to provide that earlier content to make the passage understandable. For an even better reason, it doesn’t take long to read this graphic novel, perhaps an hour or three, so it’s easy for you to get the complete context by absorbing this book for yourself. Enjoy!